After you attending several weddings, you will discover that all of them are so the same. But there are still some people who want to surprise others by changing traditional wedding mode and give the guests a visual and sensory experience which they never have before. Have you ever seen a bikini wedding in a temperature of more than 30 degrees below zero? This does happen in Krasnoyarsk, a city of Siberia, Russia. A member of the local winter swimming club kisses his bribe Irina Kuzmenko in a world of ice and snow, which is a beautiful and cold scene. They held a winter swimming wedding at a low temperature in the Yenisei River. The bribe had never received any training of winter swimming before, but after a sauna she firmly attended the wedding. If this is not exciting enough for you, a cemetery wedding may shock you. In 2012, a newly couple from Minnesota, US hold their wedding in the cemetery so that their late parents can witness the belated wedding. It is said that the groom Randy Kjarland and the bride Diane　Waller are childhood sweethearts and both parents are strongly in favor of their relationship. Due to a dreadful error, they each marry others. While things take a decisive new course when they both get divorced and meet again. Finally, they hold hands. 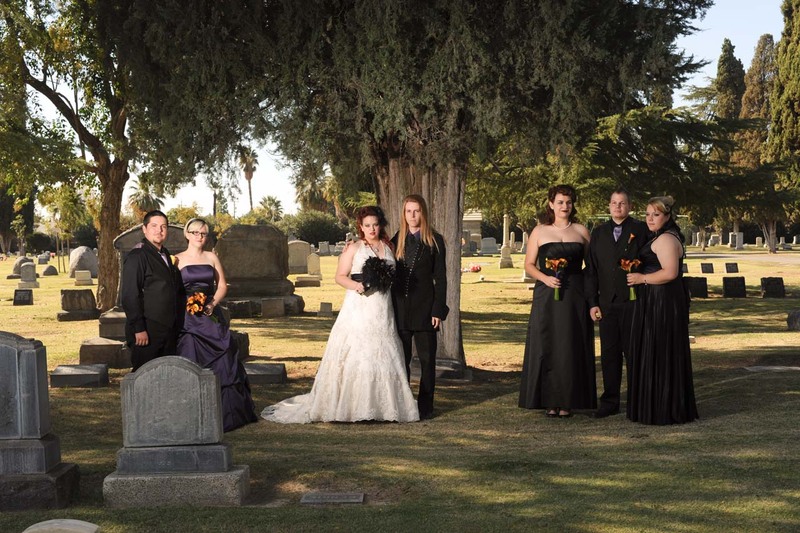 A cemetery wedding is moving, while a can be interesting. There is a super hero dream in most general people’s heart. An English couple named Sharon Vaughan and Neil　Vaughan choose to dress up as wonder woman and batman separately and have their wedding held. The brides wear clothes of wonder woman instead of wedding dress. At the same time, those invited are asked to dress up as other super heroes. If you have ever dreamed of a wonderful white wedding, someone achieved this for you. In May of 2012, a 49-year-old explorer Borge Ousland braved the bitter cold and went to North Pole with his wife for a unique wedding. Only 15 people present including the godfather, groomsman, bridesmaid and the helicopter crew testified the sweet and happy moment. The brides wear a white wedding dress, standing in a world of white snow, received the wish of them and to be a first new couple swore “I do” in the North Pole. And there are someone holds his wedding in the sky. Ellis Thai – Hodgson was once an elite paratrooper of the Royal Army Parachute Regiment. Unfortunately, he lost his legs in a boom made by the Irish Republic Army. With artificial legs, he strived to become stronger and managed to fly to the sky again and defeat many healthy players and wins championships successively for years. He obtained the qualification for parachute instructor in 2005. 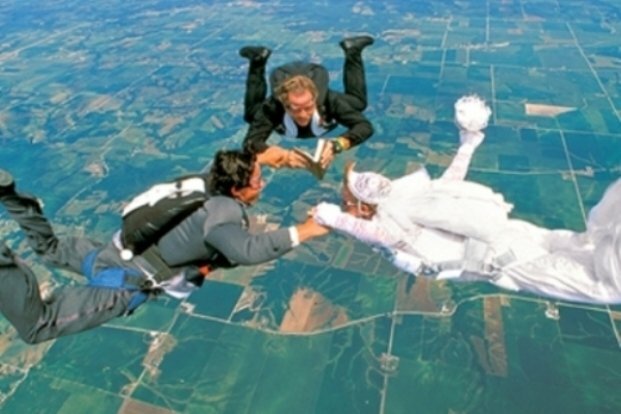 And a year later, he married his like-minded parachute partner Pippa, a healthy woman. They flied about 1676 meters above the sky of Arizona, US in a hot air balloon. After exchanging rings for each other, they both jumped from the lifting cage and finished a romantic air wedding.